With a map, a compass, some time, and all the knowledge you've learned so far, you can plan out your next wilderness trek from the comfort of your own warm home. Why bother doing this? You'll know how far each day's hike will be. You'll know where to set up camp. You'll know when to expect strenuous and easy terrain. You'll be more familiar with the area in general so if you do get lost or injured, you have better chances for survival. You'll leave a copy of your trek plan with other people to help with rescue efforts if things go wrong. 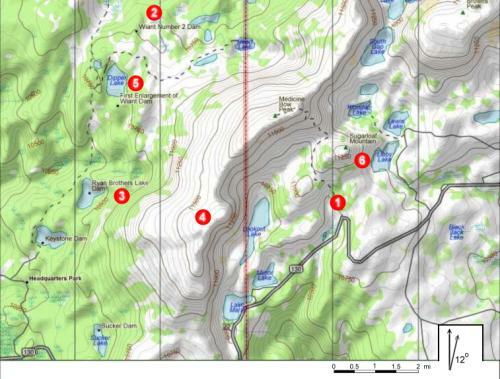 Waiting for water to boil for dinner is a great time to check out tomorrow's route and discuss what to expect on the trail ahead. Every day on the trail should include a time to review how well you are following your plan and what adjustments need to be made. Get oriented with where you are on the map - your current position. Figure out where on the map you want to go - your destination. Examine the space between the two points. Look for obstacles such as swamps, lakes, rivers, cliffs, mountains, and such that you may need to go around rather than through or over. Find the easiest, prettiest, shortest, or in some way best path to your destination - its up to you. From your starting point, put your compass on your map and Read your Heading for the first leg of your trek by adjusting the orienting lines of the compass with the meridian lines on the map and reading the direction at the index pointer. Using the map scale, estimate how far this leg will be. Considering the contour lines and terrain features, estimate how long this leg will take to cover. Remember, going uphill will take longer. Higher elevations will take longer. Having no trail will take longer. Thick forests, large rock fields, sand, ... will take longer. Record your details on your trek plan and repeat for each leg of your trek. Click this image to open a larger version of it in a separate window. You can print it out to practice route planning. Check the Medicine Bow Peak trail for down trees or other obstructions for a trail crew to fix in two weeks. Check the Wiant Number 2 Dam for winter damage. Check Ryan Brothers Lake Dam for winter damage. Find and remove a geocaching site reported on the peak overlooking Lookout Lake. See how good the fishing is in Dipper Lake in the morning and evening. Get a picture of the sunrise on Medicine Bow Peak from the top of Sugarloaf Mountain. Each Index contour line is _____ feet. Each Intermediate contour line is _____ feet. The local declination is _____ degrees East. The map scale is 1 inch equals _____ miles (or whatever the reproduced scale gets resized to). Decide where and when you will be dropped off. Decide the route through the mountains you will take. Decide where you will camp each night. Decide where and when you will be picked up. Adjust the declination of your compass, or figure out how to point true north. Figure out each leg of your trek, writing down important information in your trek plan. Did I identify rough terrain and give more hiking time for those miles? Did I camp in a fairly flat, protected area, safe from flooding and off of trails? Did I use existing trails as much as possible? Did I reach camp well before darkness with plenty of time for setting up camp and making dinner? Did I avoid fragile or potentially dangerous terrain such as swamps and rock slides? Did I meet all my trek goals? This example comes from the east starting in the afternoon. This fulfills all the work and fun goals and has a nice, short first day. The bad part of this trek is the steep ascent of Medicine Bow Peak and the potentially long 2nd day, starting very early for the sunrise. This example comes from the west starting in the morning. This fulfills all the goals except the sunrise photo. The first day is all on trail and a gentle climb. The 2nd day climbs the easier west side of Medicine Bow Peak instead of the steep east side. A 2nd night of camping is saved by this route but the second day is long. A man builds a small square house with all four walls facing north. He looks out his window and sees an animal. What does he see - a bird, a bear, or a beetle? His house is built directly on the south pole so it must be a bird he saw - a penguin. no insects live there and no polar bears either. I'm afraid your puzzle about the penguin at the south pole won't work. The south pole is 1300 kilometers from the nearest shoreline, and since the penguin is a flightless bird entirely dependent on the sea for its sustenance, no penguin has ever been at the south pole. But there is a report of a polar bear sighting within 20 kilometers of the north pole, so that variation of the puzzle could work.